Strength & Speed podcast is an Obstacle Course Racing (OCR) focused podcast that aims to bring you the best techniques and training tips in OCR. What makes us different is the unique approach to taking lessons learned from other sports and applying them to OCR. Plus, we try to focus on the smaller or lesser known race series to highlight their unique take on OCR. Subscribe to the feed to keep up with the latest episodes. We will be talking and interviewing athletes, coaches and race directors from inside the OCR industry as well as athletes from other sports. Podcast is available here, on iTunes, Stitcher and Podbean. Strength & Speed owner, CTG Pro Team Athlete and Hammer Nutrition & Sinergy Sports sponsored athlete Evan Perperis. For full bio click here. Podcast production and website upkeep cost time and money. If you appreciate all the hard work we do take a minute to donate a couple of dollars to keep the information coming. Ep 37: In a uniquely formatted episode, one of the best Ultra-OCR athletes Allison Tai joins host Evan Perperis for a pre/post race interview regarding Spartan's 24 hour Iceland World Championship race. The first 20 minutes were recorded a week before the race and the second half of the episode was recorder a week and a half after the race. Allison talks expectations, performance and how it all played out. This episode brought to you by Oofos, recovery sandals that absorb 37% more impact then tradiational shoe foam. Intro/Outro provided by Marc Capaldo of Madison Ambush. Ep 36: OCR & Doping II: Human Lie Detector: In what will most likely be our most controversial and downloaded episode ever, Evan uses his personal experiences from Iraq and research done on tells of lie detection to analyze the Ryan Woods failed doping result from OCR World Championships 2017. Thanks to the Obstacle Racing Media and Link Endurance podcasts for the use of their audio. Episode brought to you by Strength & Speed, if you are looking for more information by Evan, check out his book on preparing and racing OCR. Outro music provided by Marc Capaldo and Madison Ambush. Ep 35: Editor in Chief of Mud Run Guide and the 1st Pro OCR Athlete, Margaret Schlacther gives Brenna and Evan a history lesson in the sport of OCR. If you are curious about the early days of the sport, what the first Spartan Race ever was like and how Margaret made the leap from a hobby to a full time job racing/in the media, this episode is a must listen. Episode brought to you by Marena Sport, for medical grade compression and chaffe free shorts for Ultra-OCR check out Marena Sport. Ep 34: The day of recording, Ryan Woods became the first athlete in OCR to fail a drug test. He said he accidentally confused DHEA with DHA. Nutritionist Luc Labonte and trainer Jared Renyer join Evan to talk about this news, providing their opinions and what is the likelihood of this happening to someone. This was easily the most uncomfortable and hardest topic to talk about on air but we at S&S view it as necessary. Education is the first step in anti-doping and we hope this podcast helps more than it hurts. Episode brought to you by JRen Fitness, for personal training needs from just getting off the couch to the professional OCR athlete, check out Jren Fitness. Ep 33: 2nd place team at World's Toughest Mudder (WTM), Team Merrell, consisting of Wesley "Dr. Red Tights" Kerr and Evan Perperis discuss their strategy, pacing, fueling and performance at the biggest 24 hour Ultra-OCR in the world. In this special episode, Miles Keller joins in the discussion (aka takes control over most of the podcast) to find out what WTM was like and interviews the team. Stick around to the end to hear a special shout out to Sue Harvey Brown and Merrell. Episode is brought to you by Merrell, makers of trail running shoes that are perfectly designed for OCR. Take a look at their Tough Mudder branded All Out Crush, Trail Glove and Peak Agility Flex if you are shopping for a new pair of shoes. Ep 32: Owner of JRen Fitness and personal trainer Jared Renyer talks OCR off-season training. Lots of great tips in this episode including what to work on in your off-season, specific movements to improve rig skills, isolation movements to build an overall stronger body and whether you should be training with weights as an OCR athlete. Plus, Evan picks Jared's brain on Spartan's new age group categories. This episode brought to you by Merrell. Be sure to check out their full line of OCR shoes in addition to the softest jacket known to man, Men's Micro-Lite Puffer Jacket. Ep 31: Co-host of the Link Endurance podcast joins Evan again to discuss the latest news in OCR. Main topic of conversation is the announcement of OCRWC location and changes to the USOCRC for 2018. Also, the podcast is so good, Miles names his first born son after Evan. This episode brought to you by Merrell. Be sure to check out their line of OCR shoes including All Out Crush, Bare Access Flex, Trail Glove and Vapor Glove. Ep30: BOOM! Another all CTG Pro Team Episode featuring the only woman to stand on the overall podium of both OCRWC and WTM, Amy "Magic" Pajcic. Amy talks about Mud Ninja, Black Swamp Dash, Indian Mud Run, her experiences on ANW and how she maintains her fitness as a veterinarian. Ep29: Evan asks for listener questions from Facebook and provides answers to topics including tapering, rig specific training, attendance of OCRWC, how to train for OCR without a OCR gym, questions about ANW, mental training, Ultra-OCR and off season training. Thanks to Jared Renyer, Brian Fisher, Sean Langworthy, Chris Passanisi, Robert Bondoni, Jack Bauer, Koton Wood, Bilal Jamal, Matthew Puntin and Laura Hein McElduff for the questions. This episode brought to you by Merrell. The official shoe of Tough Mudder, the All Out Crush, also has a line of trail shoes that are perfect for OCR. They don't hold water weight, have no insole and are durable. Ep 27: Conquer The Gauntlet Pro Randi Lackey joins Evan and Brenna for an all Conquer The Gauntlet Pro Episode. Randi shares the craziest story we have heard on S&S and explains how CTG saved the life of her daughter...literally. The team also discusses the CTG Tulsa team race, Randi's fitness accomplishments, how she was on the verge of an eating disorder and how she became the female athlete with the most CTG wins in history. Also, Brenna gives a shout out to X Racewear and Evan talks dryrobe and IronMind Enterprises, Inc. This episode brought to you by sponsors of the CTG Pro Team: MudGear, Atomik Climbing Holds, Harbinger Fitness, RockTape, Juice Performer and Marena Sport. 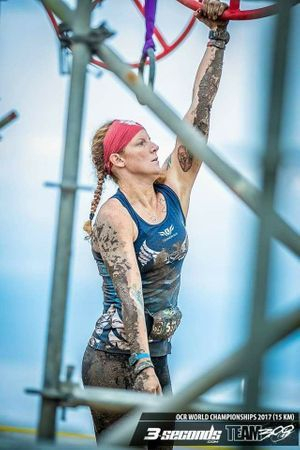 Ep 23: The bronze medalist from the Pro USOCRC 3km Julie Hartjes joins Evan on this week's episode to discuss her amazing performance, what the first ever United States Obstacle Course Racing Championship was like, how she maintains her speed despite being on the verge of the Masters division and her plans for 2018. Also, she shares some of the funny stories from other athletes and announcers as she made her way to a top three finish. Episode brought to you by Strength & Speed. Check out the discount section for the latest from Wreck Bag (SS10 gives you 10% off), a $10 off link for Neptune and to pick up your copy of "Strength & Speed's Guide to Elite OCR". Ep 26: Hammer Nutrition sponsored Athlete Karin S. Weller talks Ultra-cycling with Evan Perperis. Topics covered include fueling for ultra-endurance sports, the world of ultra-cycling, how she uses a "video game" to enhance her training along with similarities between cycling and OCR. Also, Evan shares what he thinks is the hardest endurance sport in the world. If you are into endurance events, this is an episode you don't want to miss. This episode is brought to you by Hammer Nutrition, the world leader in endurance fueling. Use ref # 240887 for 15% off your first order. It's an all Conquer The Gauntlet Pro Team episode!!! CTG Pro Lucas Pfannenstiel joins Brenna Calvert and Evan Perperis to talk about how to start your own OCR training group like KCOCR. Plus, Brenna and Lucas tell Broken Skull Ranch stories, Lucas shares his recent experience on American Ninja Warrior and Evan gives a shout out to his favorite charity Folds of Honor. This episode brought to you by Juice Performer. Order Juice Performer's Beet or Cherry flavored products off of Amazon and use code 1CTGBP15 for 15% off. Pickup a copy of Strength & Speed's Guide to Elite OCR here. Ep 24: The lightest women to ever total of 1000 lbs and Powerlifting Team Manager for Complete Human Performance, Jen Rotsinger, joins Evan for a discussion on powerlifting and OCR. Topics include improving grip strength, the progression of the sport (OCR vs. Powerlifting), nutrition and more. Jen is also the co-owner of Gorilla Bench Training Center in Clearwater, Florida and a microbiologist with Kindred Healthcare. Intro/outro from Marc Capaldo and Madison Ambush. Ep 22: Co-founder and co-owner of Mud Run Guide Brett Stewart talks about starting Mud Run Guide, creating the first head to head OCR show, OCR Warrior and what athletes can look forward to at USOCRC. If you are headed to TX for the first US OCR Championship, this is an episode you absolutley don't want to miss. Episode brought to you by Ompu bringing you apparel needed to perform at the highest levels of OCR. Ep21: Brenna Calvert and Evan Perperis catch up on recent races including their recent trip to Lebanon for the OCRWC Qualifying Hannibal Race, Brenna's Savage Race Chicago experience and Evan taking on 24 hours of Shale Hell by himself. Special shout out to Folds of Honor and World's Toughest Mudder Community for their great charity work. Episode brought to you by Atomik Climbing Holds. Ep20: International Fitness Icon and co-owner of the Hannibal Race, Amine Dib talks about Lebanon's only OCR. Episode includes what may be the first live broadcast of OCR anywhere in the world, the future of the race series, possible expansion locations, a possible deal with Spartan, plans to attend Blue Mountain and OCRWC qualifying. Plus, Evan finds out about his upcoming trip with CTG Pro Brenna Calvert talking and shares some sneak previews of great OCR content that will be published later this week. Episode brought to you by Juice Performer. Use code 1CTGBP15 on Amazon.com for 15% off your order. Ep19: Owner of the only running store in Clarksville, TN, The Runner's Hub along with accomplished ultra-runner Travis Esterby joins Evan Perperis. Topics discussed include ultra-running training, what Western States along with Leadville ultra-marathons are like, how his 20 year military career made him a better athlete and what it is like opening your own running store. Plus, learn the secret of Evan's long runs. If you are going to be at the Spartan Sprint Nashville in August, make sure you stop by the Runner's Hub (soon to be a Fleet Feet). This episode brought to you by Hammer Nutrition. Use ref #240887 for 15% off your first order. Pick up Evan's book "Strength & Speed's Guide to Elite OCR". Intro/Outro music from Madison Ambush. Ep18: Hosts of the Overcome and Run Podcast, Jay Bode and Heather Bode, join Evan to discuss breaking into the OCR Podcast world, the future of Overcome and Run, Jay's plan for training on deployment and thoughts on recent OCR Media (including Spartan Ultimate Team Challenge, American Ninja Warrior and Team Ninja Warrior). Additionally, Evan and Jay prepare their audition tape for hosting Spartan Ultimate Team Challenge. Ep17: Battle Corps and S&S Dev Team Athlete Leah Hensley joins Brenna and Evan to discuss recent 8 hour Ultra-OCR events including Toughest Mudder Atlanta, Toughest Mudder Philly and Dirt Runner's Midwest Mayhem 6 hr event. This episode is brought to you by Marena Sport, use code MSportCTG for 20% off your order. Intro/Outro music brought to by Marc Capaldo and Madison Ambush. Ep 16: Brenna Calvert and Evan Perperis discuss their recent race results and experiences including Brenna's podium finish at Savage Race Georgia, Evan's 1st place at Warrior Dash TN and discussing the hardest (?) four miles of OCR at Conquer The Gauntlet Atlanta. This episode brought to you Hylete. Ep15: Ultra-OCR Australian athlete Timothy Oliver shares with S&S his secret to success, how World's Toughest Mudder is different than True Grit Enduro 24 and details about the Australian OCR scene. For any Australian's listening to this that want a copy of the book "S&S's Guide to Elite OCR" message Strength & Speed or Evan Perpers on Facebook and he will bring a copy to True Grit in June. This episode brought to you by Hammer Nutrition. For 15% off your first order use ref# 240887. Ep14: California's Strongest Man, top 10 finisher at National's and 6th at Arnold World Championship Strongman Kalle Beck joins Evan to discuss the application of Strongman training to OCR. The owner of StartingStrongman.com and coach for Complete Human Performance, Kalle shares his views and highlights similarities between OCR-Strongman, topics include television appearances, drugs, developing hype, standardizing the sport, negative aspects of the Olympics and much more. This episode brought to you by Harbinger Fitness, for weight belts, weight vests and fat bar training, head over to Harbinger. Ep 13: Strength & Speed Developmental Team athlete Serra Langone joins Brenna and Evan to discuss her recent win at the multi-lap FIT Challenge, her experiences of the Dev Team and how she balances work-life-training. This episode brought to you by RockTape, check out their website to find out why they are more than a tape company and are more of a movement company. Ep12: The 2nd place team, Strength & Speed, discuss their experiences at the first ever Terrain Racing Relay 24 hour race. Joining Evan Perperis is Miles Keller, Ryan Owen and Chris Polito. The team talks about the format (strength, speed, technique), their strategy for racing/fueling and gives a special shout out to dryrobe. This episode is brought to you by Sinergy Sports for great OCR training tools to improve your home gym, shop at Rob Butler's Sinergy Sports where "strong isn't strong enough." Intro/Outro music from Marc Capaldo and Madison Ambush. Ep 11: Wisconsin OCR athlete Jordon Buscemi shares his secrets of success and how to podium at OCR World Championships along with how he manages to balance work/life balance with his 20+ first place finishes. Also, Evan offers help for Ultra-OCR and Brenna asks about future plans. This episode is brought to you by Harbinger Fitness. Intro/Outro by Marc Capaldo of Madison Ambush. Ep 10: Brenna and Evan recap some of their recent events including: Brenna's experience at Green Beret Challenge, Mighty Mud Dash, Spartan Race. Evan's recent injury recovery using dry needling and blood flor restriction training. Additionally, S&S shares their international travel plans including Lebanon & Australia!!!! This episode brought to you by Mudgear. Use CTGSTRONG for 10% off your order. Ep 9: Co-host of the Link Endurance podcast Miles Keller joins S&S host Evan Perperis for this episode of the podcast. The two discuss a ton of OCR topics ranging from Terrain Race, OCRWC, podcasting, USAOCR and the Olympics. Also, Miles considers switching sports to rhythmic gymnastics while Evan considers getting into horse dancing. This episode brought to you by Hammer Nutrition. For 15% off your first order use ref # 240887 or click the link. Ep 8: Sandy and Troy Anthony are interviewed about their three race series Black Swamp Dash in Ohio. Also, Evan gets excited about multi-lap options (I know...big shocker) and Brenna decides to return for another shot at the Black Swamp Foot trophy. Ep 7: American Ninja Warrior competitor and Wolfpack Ninja leader Noah Kaufman talks about his upcoming Wolfpack Ninja Tour, his opinions on ANW, his training regime and the upcoming show Ultimate Beastmaster. Also, Evan shares his opinions on some of the things from Ninja Warrior that upset him. This episode brought to you by Atomik Climbing Holds. Intro/Outro by Marc Capaldo and Madison Ambush. Ep 6: Conquer The Gauntlet co-owner David Mainprize talks about how CTG got started in 2012, where they are going in the future and the challenges the company faces in expansion. Also, Evan talks about how CTG changed his perspective on obstacles and Brenna asks a serious question about OCRWC. Ep 5: Multi-time Spartan World Champion and former BattleFrog Pro Team Athlete Claude Godbout discusses her 2016 season (which ended in March due to injury), her plans for 2017 and the upcoming Northman race in Canada. Also, Brenna discusses OCR Power Couples and Evan gets some Biathlon lessons learned for OCR. This episode is brought to you by Mudgear. Use code CTGSTRONG for 10% off. Ep 4: Multi-time World's Toughest Mudder Veteran and Battle Corps Athlete Jason Rulo talks about The Battlegrounds permanent OCR facility in Wright City, MO and about his new creation the Neptune Thermoregulation system. Also, Brenna commits to Ultra-OCR and Evan discusses his topical solution for fixing being uncomfortable. Ep 3: Logan Nagle, #19, from the History Channel's The Selection shares his experience of this life changing event. Brenna and Evan pull lessons learned on mental toughness, perseverance and grit, applying them to OCR, World's Toughest Mudder and life. Ep 2: Evan & Brenna talk to CTG Pro Ashley Samples about racing, an unexpected pregnancy, a season cut short and the challenges of being a new mom/athlete. Also, Evan decides to start OCR Tinder and Brenna offers herself to the men of the OCR world. Ep 1: Evan Perperis and Brenna talk about the start of the podcast, what to expect and their plans for 2017. Intro and Outro music for all episodes is "From Another Day" by Madison Ambush. Music used with the permission of Marc Capaldo.